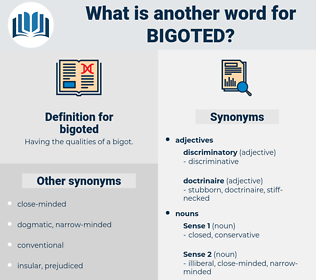 What is another word for bigoted? 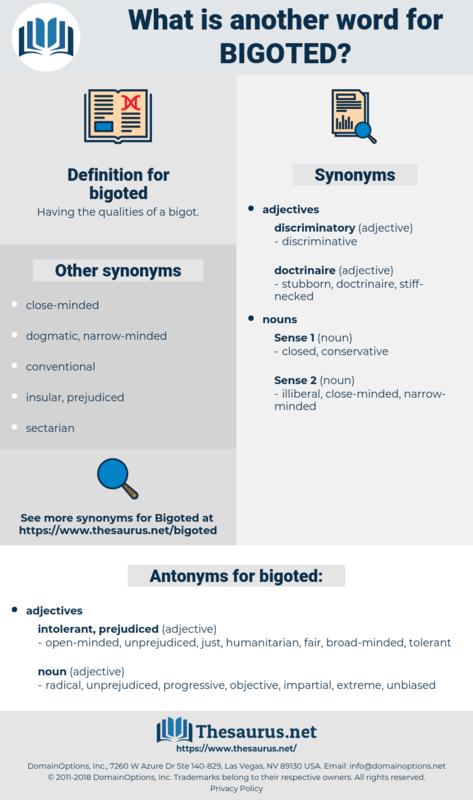 Having the qualities of a bigot. open-minded, unprejudiced, just, humanitarian, fair, broad-minded, tolerant. extreme, unbiased, progressive, objective, radical, impartial. I should have expected from the intelligence and judgment of our citizens that they would have deferred neither to the sickly sentimentalism of a bigoted morality nor to the absurdity of obsolete dogmas. And Minnie is gone; she is entering into all the interests of the Thynnes, by this time: and a most bigoted Thynne she will be, if there are any special opinions in the family.